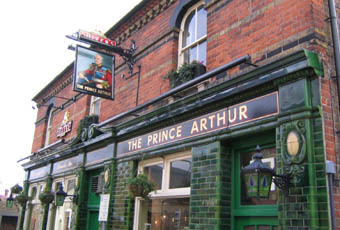 Typed 'best pub to watch the rugby in Windsor' into a search engine and this place came up. Stopped in for the lions match on Saturday morning and the place was as you might expect. Small Fullers pub, clean and pleasant with a few small dogs running about. Managed to get the last couple of seats although it didn't get any busier after that. They only had 2 ales on, one of which pride looks fairly permanent. Nice enough pub and everyone in there (20 or so people) were all watching and enjoying the match. Was in here yesterday. It's a Fullers street corner local. London Pride & Spring Sprinter were the 2 real ales. The one room is L-shaped and was reasonably busy on my early evening visit. It's a fair walk from the town centre down here and not really worth the effort. Witnessed a rather unpleasant exchange between the oaf of a landlord and and some quiet middle aged customers. When they dared to politely question the price (�6.00!) of some disgusting looking beefburgers, the rude and unpleasant landlord told them they wouldn't be served anymore and that they should leave! After seeing this landlord's attitude to customer service I will never use this pub again. wow what a great place to watch the rugby. A pint of Fullers and pie. What more do you need with the six nations.